A fast, cost-effective workgroup printer for increased productivity. The WorkForce Pro WF-6090 letter/legal-size printer, powered by PrecisionCore®, saves up to 50 percent on printing costs vs. color lasers1. Minimize downtime with Epson's highest-yield cartridges, which print up to 7000 black/color pages2 before replacement, and a paper capacity up to 1580 sheets3. 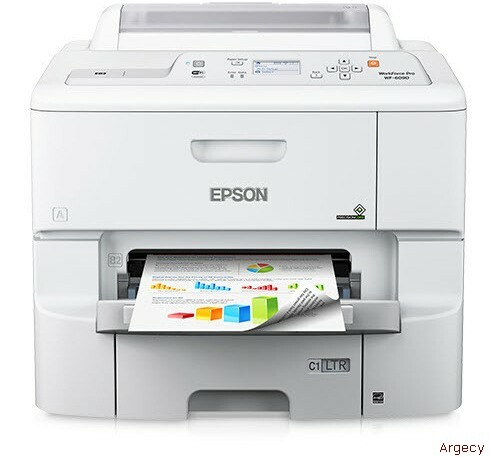 Epson's fastest office printer, the WF-6090 includes built-in auto duplexing and delivers pro-quality documents as fast as 24 ISO ppm (black/color)†. IT tools and security features make network integration seamless for shared printing. Plus, it's enabled with remote printer data collection compatible with MPS software solutions4. Quickly print documents and photos, and get sharp text and vivid, true-to-life color. Print documents that are highlighter friendly as well as smudge, scratch, fade and water resistant. PC-Free Paper Support: 3.5" x 5", 4" x 6", 5" x 7", Half Letter, Letter, Executive, 8" x 10", 8.5" x 11", Legal, 8.5" x 14"